This is the fourth series TLC has made revolving around Buddy Valastro, also known as "The Cake Boss." 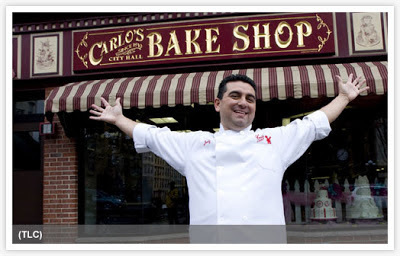 He introduces this show by saying that Carlo's has been successful his entire life, but because many other family bakeries have not been that fortunate, he wants to help. It is not certain how many episodes of Bakery Boss have been filmed at this point, but no more are currently on TLC's schedule, so when we will see another episode is anyone's guess. Of course, I hope that the seasonal cues aren't as bad in other episodes... I mean, wasn't it kinda funny that it's summer but it's snowing in the episodes? Anyway, this isn't really my "type" of series, and I didn't find the family in "Friendly Bake Shop" all that endearing, so I'm not sure how long I'll stick around, but, out of curiosity, I'll likely cover a few episodes. Bakery Boss "Friendly Bake Shop" (S01E01): Buddy travels to Frankfort, NY (near Utica) to help out an Italian-American bakery that opened in the early 1960s. Three brothers took over the company thirty years ago, and three adult children from the next generation are now helping. [I was shocked that not everyone even takes a salary and that one of the dads only gets like $500/week!] The bakery used to do all kinds of cakes and pies, but now they focus mainly on breads and rolls, though their menu does include 8" cakes for $17, blueberry muffins for 95 cents, cannolis for $1.75, and cinnamon buns for 90 cents ($8.25/dozen). Buddy has a lot of ideas for fixing this business, but the first thing to be addressed are the baked goods themselves. The cream in the cannolis is too sweet, the store-bought chocolate filling in some of the items isn't great, the eclairs are boring, and the muffins are really dry. [yeah, I'd probably struggle to swallow that criticism, too!] However, the family thinks that these items are 9s and 10s, which is sad.